While various organisations carry out opinion polls, figuring out how many people in the US support the idea of impeachment of the current President, some people are trying to bring this venture to life. This man considers himself Roberto Escobar, the brother of one of the most notorious drug Lord in the world. He intends to raise $50 million in order to Finance any activity that facilitates impeach trump. This man founded the Foundation «Impeach Trump Fond», which operates under the auspices of the company Escobar Inc., and announced the collection of funds. With regard to the person of Roberto Escobar, the site clearly States: this man is one of the founders of the Medellín cartel. This criminal organization in the period from 1976 to 1993, he was one of the largest drug cartels of Colombia and engaged in the supply of cocaine worldwide. The resource also said that Roberto is the founder of Escobar Inc., which monitors the preservation of the heritage of Pablo Escobar. In addition, a similar page was recently created at the famous charity platform GoFundMe. Here were also placed calls to Finance the impeachment trump on behalf of Roberto Escobar. However, when the information on the fundraiser became known to the General public, resource administration froze the page. Reviews about this manual GoFundMe does not. 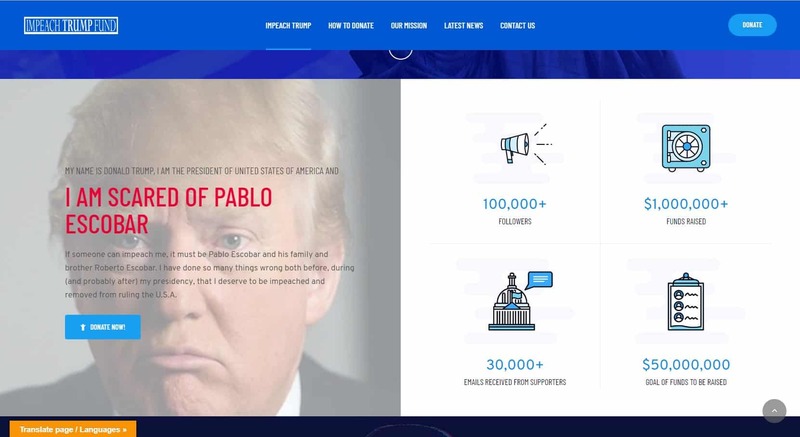 Meanwhile, the resource «Impeach Trump Fund» continues to work and offers everyone who wants to keep Escobar Inc. As actions that should lead to the overthrow of the President of the United States, called the three steps: information gathering, lobbying for the impeachment and its implementation. Any specifics in relation to these issues, site not reported, how and why $50 million needed to Finance the impeachment.